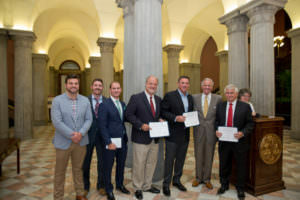 Triangle Receives SC Historic Preservation Award | Triangle Construction Company, Inc.
On June 16, the winners of the 2017 SC Historic Preservation Awards were honored during a ceremony at the State House. Triangle Construction Company, along with Garvin Design Group and PMC Property Group, were on hand as Palmetto Compress received the Honor Award from Governor Henry McMaster. The Honor Awards celebrate successful and exemplary historic preservation projects around the Palmetto State. Originally built in 1917, it is one of only three buildings of its type and size remaining in the country and is recognized on the National Register of Historic Places. It originally served as a cotton compress facility and was one of the largest cotton warehouses in the state. The building actually faced demolition in 2012 but was saved by a grassroots effort. The rehabilitation project focused on preserving the original warehouse form, while giving it new life as an apartment and retail building. Palmetto Compress now helps anchor a transforming district between downtown Columbia and the riverfront.